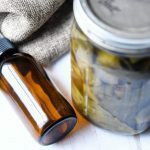 Learn how to make horehound cough drops at home with a handful of ingredients, then use this natural cough remedy to break up your cough when you’re sick. 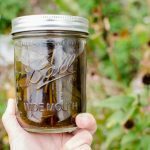 If you’ve ever learned to make hard candy, then you can make horehound candy! And if you can make horehound candy, you just made horehound cough drops! I tried growing white horehound from seed, and while I can’t for the life of me remember transplanting it, I must have because I found a large beautiful plant growing in one of my beds. I’m glad I didn’t weed it in my absent-mindedness! I’ve since also found it growing wild in meadows near our home, so I’ll be able to pick and forage this herb every summer as a home remedy for coughing as part of my family’s homegrown & homemade medicine cabinet. What Is Horehound Good for, and What Do Horehound Cough Drops and Horehound Candy Taste Like Exactly? Horehound candy is the same as horehound cough drops. The taste is bitter, which is why adding sweetener is a necessity! The way you enjoy these candies is by sucking the extract out of them. Did you know horehound is actually in the mint family? It has a mingling taste of licorice and the rooty flavor of root beer. The best way to describe horehound cough drops or candy (one and the same) are as bittersweet. If it is sweetened correctly, there is a sweet and bitter duo that makes this the perfect candy and medicinal throat help. It is a soothing, sweet old school candy. The reason for this is the way they can be made in the home, with an ingredient that grows in your backyard! These have been made for centuries before us. Horehound grows in places like Europe, North Africa, and Asia. It has been used to treat tons of health issues. There are even ancient texts that outline the uses of this herbal remedy. It was used to help with everything from sore throats, as we advise in this article, to digestive issues. So What Makes This a Medicinal Herb Exactly? Those who came before us know that horehound candy has medicinal purposes, which is one of the best duos possible for sick, sweet lovers. In this plant are found so many health supports. The way this plant helps to stimulate appetite is by aiding as a type of tonic, because if the bitterness. It helps to produce saliva and stomach juices which help hunger to increase. Though there is no evidence that horehound helps motion sickness, it has been known to do just that. If you are feeling a bit queasy, ingesting some of these candies may help. This herb helps inflammation to go down and mucus to come up. It is a natural soother and allows things to run smoother while sick with bronchitis. 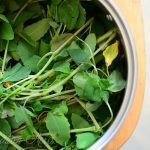 This herb aids digestion with the bitterness it contains. Bitter ingredients help digestion because they increase saliva and stomach juices, as we saw before in how bitterness supports appetite. The reflux we have to bitterness is a stimulant that acts as a type of tonic for our internal organs. This helps with food breakdown and acts against these three listed stomach issues. The thing that causes these two components is coughing. Thankfully, horehound is a great cough relief. It even has an ingredient you can find in lozenges (the natural kind). Because it helps get rid of mucus, it reduces coughing by breaking the irritant down. The two words you need to know are analgesic and antispasmodic, which basically chock up to pain relief. This herb can be used to treat cramps and other menstrual pain. 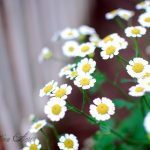 Things like mood swings and upsetness that can come with PMS are reduced greatly when implementing horehound into your diet, like in a tea or a capsule. The herb has also been known to treat uterine fibroids. White horehound has been known to lower cholesterol and reduce blood sugar levels. It even helps glucose to flow and allows less of the sugar rush and crash. Horehound has been seen as a solution to the blood and sugar changes in those with diabetes. Baths are a great way to help you heal, rest and relax when sick. There are certain therapeutic herbs that can enhance these things when put in a hot bath. The horehound herb is one of them. It specifically helps bronchitis and coughs, as we have seen above. An excellent herbal soak is the same as drinking a cup of tea, but for the outside of your body. As a matter of fact, taking a bath with Horehound is best done by brewing the tea as seen below, and pouring it into the bath. You can also add other herbs and essential oils in order to enhance the benefits of your bath. Maybe one day we will get Horehound bath bombs! This way to prepare horehound can help with ugly flu and cold symptoms. This is as simple as using organic horehound herb leaves and brewing the tea your usual way. Use honey and lemon juice as natural sweeteners! You can purchase these tea leaves, or tea bags, ready to use at pretty much any store that sells tea. Some of the best can be found at any vitamin store, but you can also find them anywhere food is sold. If Horehound candy is a thing, you can imagine why it would be great as a cough syrup. It is an instant calmer that breaks up the mucus in your system and helps your body get rid of it faster. It also avoids all the awful side effects over the counter cough syrups produce such as grogginess and fogginess. Keep in mind that horehound is bitter, so it is best to add in honey, and some recipes even pair it with other sweetening agents. Horehound cough syrup can be purchased as well, and there are versions made with all types of various components, usually sweeteners such as Wild Cherry Bark. Directly applied to the wounds, horehound has been used to heal cuts and bruises for centuries. It has also been used to heal ulcers, wounds, and other damages to the skin such as eczema and even shingles. This is a great skin ointment which can be easily created at home from Horehound extract. These ointments can also be found in bottles with droppers in stores. Horehound’s active ingredients are “sesquiterpene bitters, marrubin, volatile oil, tannins, flavonoids, and mucilage” 1. These properties aren’t lost in the heating of the herb, a fact you can taste and feel! Horehound candy is known to be bitter, and that’s why you won’t want to mess around with the sweetener on this recipe for horehound cough drops. Horehound can’t work on breaking up mucus, soothing your sore throat, and quieting your cough if you can’t bear to have the taste on your tongue. 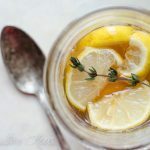 The necessary steps of making these cough drops include steeping the herb in hot water and then combining the infusion with a sweeter (horehound is pretty bitter! Trust me, you’ll want the sweetener!) and a few other ingredients. Not included are artificial sweeteners, flavors, preservatives, or food dyes (you know, things that weaken your immune system and general health when you need your body working the best.) You bring the ingredients to a boil and then raise the temperature even higher. When it has reached the right temperature, pour the liquid into a prepared pan and roll them into balls. It couldn’t be more simple, could it? In fact, check out my kids helping me make our own horehound cough drops! The most challenging part of making your horehound cough drops is getting the balls rolled before they are too hard to work. You can trust I had a lot of little hands on this project and by the end, we were still snapping a sheet and wrapping the broken pieces. I’m going to try a silicone mini-ice cube tray or candy mold next time. I think that’s a good idea to work around that issue! Place the horehound in a mason jar and cover it with a pint of boiling water. Steep the horehound for 30-60 minutes. Grease a 9 x 13 baking dish with butter. Strain the herb from the water, squeezing the herb to remove all the liquid, and then discard them. Pour the liquid into a large stockpot and add the sugar, honey cream of tartar, and lemon juice. Bring the liquid to a boil and continue to boil it until it reaches 240 degrees on a candy thermometer. Continue to raise the temperature until it reaches 300 degrees and then pour it into the buttered pan. Cool the liquid for a few minutes until you can stand to touch it without getting burned. Don't wait too long or you won't be able to get them rolled before they're too cool to mold. Pinch off a bit of the candy and roll it into a cough drop sized and shaped ball. Wrap it in a bit of waxed paper and store them in the refrigerator until you need them. Have you tried this horehound candy recipe? These are great and they work so well! Horehound is easy to grow, too, except that you have to watch it once it reaches the flowering stage because those flowers turn into stickery seed pods that bite, rotten buggers. Otherwise, it's a great plant. Have you tried making these with Molasses & honey instead of sugar? I try to limit how much sugar my kids and I consume. I haven’t tried that, but if I was going to I think I would find a recipe for candy using those and adapt it to include horehound instead of adapting this recipe for the honey. A couple problems to be aware of, making candy with honey often has grainy results from the crystallization and if you’re thinking of using raw honey, all of the health benefits would be cooked out by the time it’s in candy form so I would definitely use cheaper store honey for this purpose. Hope that helps! Wait a few minutes to cool till it can be touched. Take something with a straight, sharp edge (I use a straight-edged cleaver, but a pancake turner, putty knife or broken plastic ruler works fine), butter its edge, and press it into the surface to make deep grooves horizontally and vertically, marking about 1″ squares. Re-butter the edge frequently. Let candy get fully cold. Take the whole slab out, put it in a bag, and either bend it till it breaks into squares, or whack it gently all over the back surface to achieve that. Wrap the squares if you want, or dust with fine sugar and keep sealed in a tin in a cool, dry place.